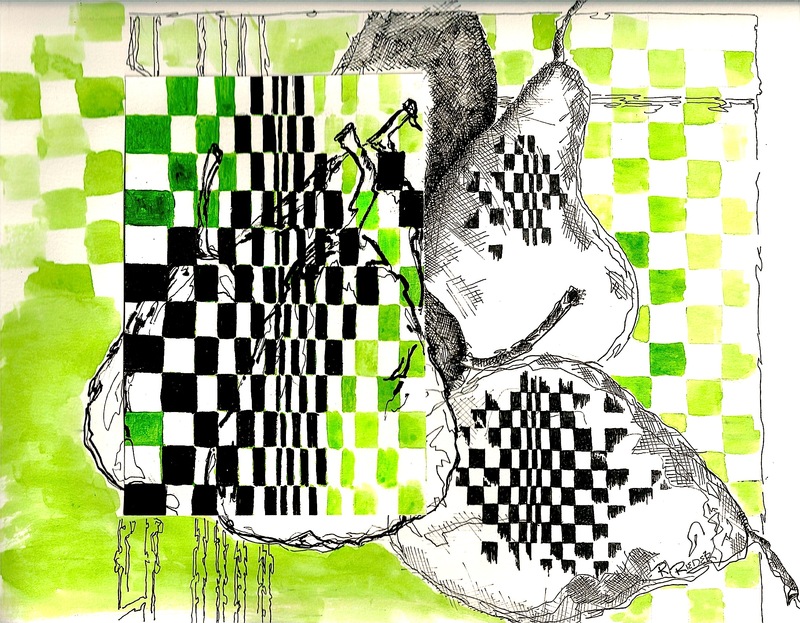 Promiscuous PEARS… | Jots from a Small Apt. pro-mis-cu-ous: adj. 1) Composed of persons or things confusedly mingled. Excellent! What wonderful use of drawing combined with watercolor! Thank you Leslie. Am looking for a “frisket” project…you have inspired me. I really like your watercolor and graphics. Your stuff is really so much better than mine. Enjoyed reading about the class you took where the teacher only used brush and paint….no drawing allowed. I choked on that and began to cry. Don’t know why…it just happened. Perhaps fear of brush? Thank you, Z. Your eureka power is making me smile!! Great drawing. I love the contrast between the organic forms and the geometric shapes. And the dots of green colours add to experience. So smiling and thank you! The first thing it did was to click the image for an in-close search for promiscuity. On the other hand, a closer examination allowed me to see the detail and perception of depth. Although I’m limiting my blogging due to an overloaded plate, once I received notification of your new post, I had to drop by to see the latest from the Queen of Portland. Thinking about you and Mrs aFA and the full plates you are juggling, and hoping that time will heal those ills. Let me know when we can take another stroll around your neighborhood…walking…talking…it’s all good. It’s always a pleasure to chat with the fine Lady of Portland. Yes, a bit of a challenge at the moment, but I hope to update on the next Monday Morning Entertainment. Meanwhile, gotta keep doing what we can. So much more delicious than promiscuous pairs. Noah blushing on boat for 1point boast and racy retort regarding promiscuous pairs. it’s going to take me a while to digest that reply, darling. You cheeky devil you! You know I just love it when you call me darling…. You better watch those pears; soon there will be pairs of pears and pairs of pairs of pears….. I can tell that the pairs of pears plus one has been a solid hit. Let’s see what I can do with….FIGS!! Right you are, BTG. However…hadn’t thought of alliteration possibilities until you brought fact-filled fractured fig follies to the forefront. Shame on you…. And, a fine fig filling filly from the far frontier you are, as well, if I may be frank. Love the illusion of depth! Morning El G! How was your holiday?? All rested and recreated I hope…. Sadly, it only took a day back at work to get grumpy again. Been up since 1-30a. Three cups of coffee later….you Silly Goose…go to work! !